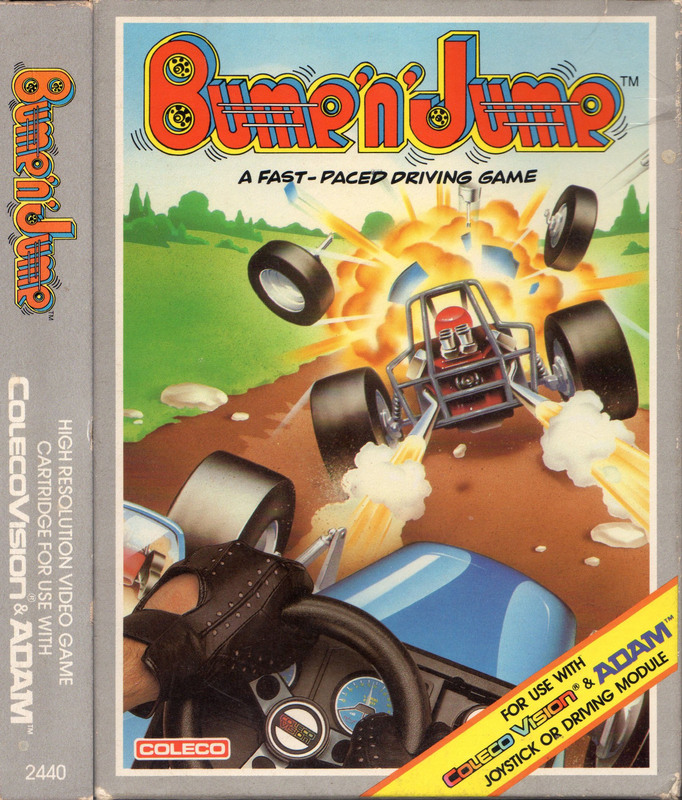 Bump’n’Jump is not an ordinary driving game ! There are new twists in this road race that combines the bumper-bouncing action of a demolition derby with the speed and skilful manoeuvring of a Grand Prix. Manoeuvre your way out of a tight spot, then put the pedal to the metal, step up to 220 mph and pull away from the pack. Bump into other cars on the roadway to send them crashing. 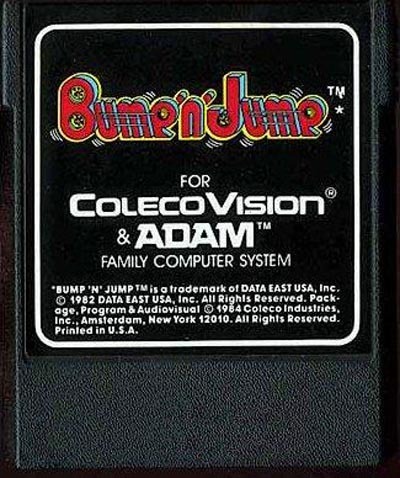 Jump to clear water hazards or to vault over an opponent. 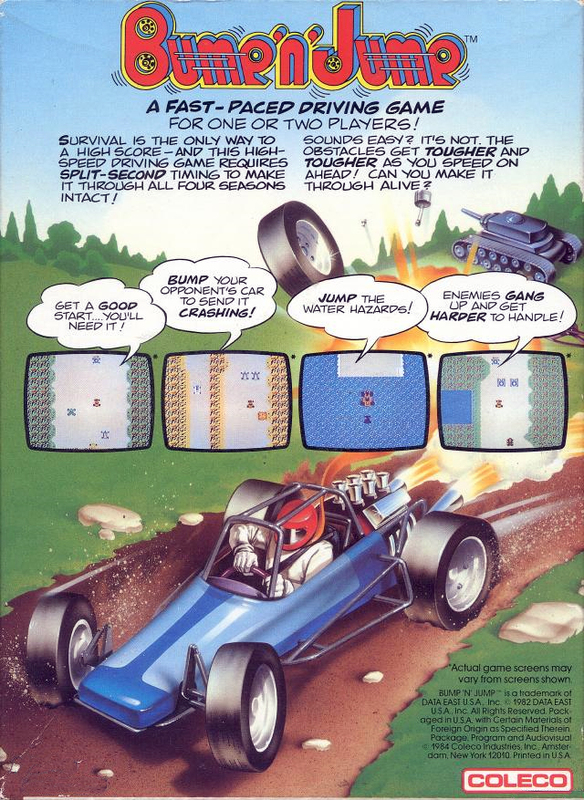 Land on other racers to earn points and eliminate them from the competition. Race through all kinds of roadways, each with its own set of hazards. You’ll travel over wide four-lanes, narrow causeways and oddly jagged twolanes. Watch out for dangerous centre islands, dirt piles dropped by the dump trucks and small water hazards. 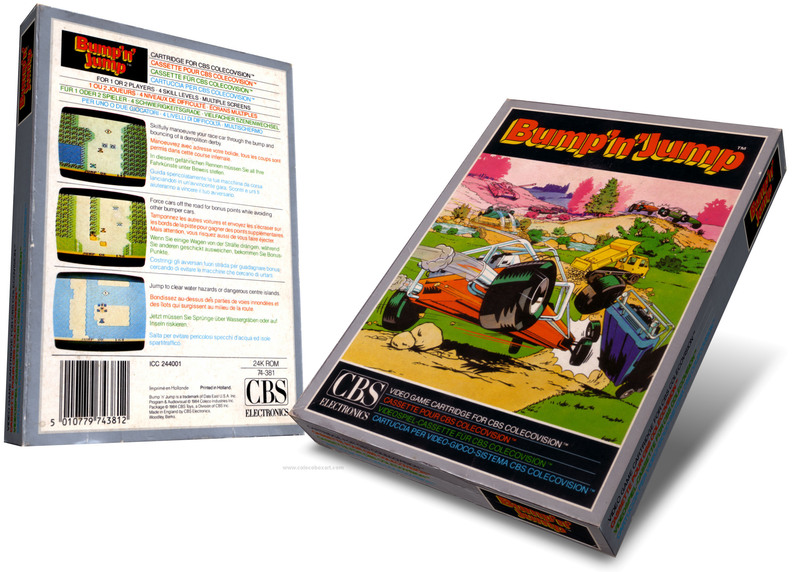 CBS Colecovision Expansion Module 2 driving unit gives the feel of a real road race. Whether you’re a driver of Indianapolis 500 class, or a beginner with learner’s permit. 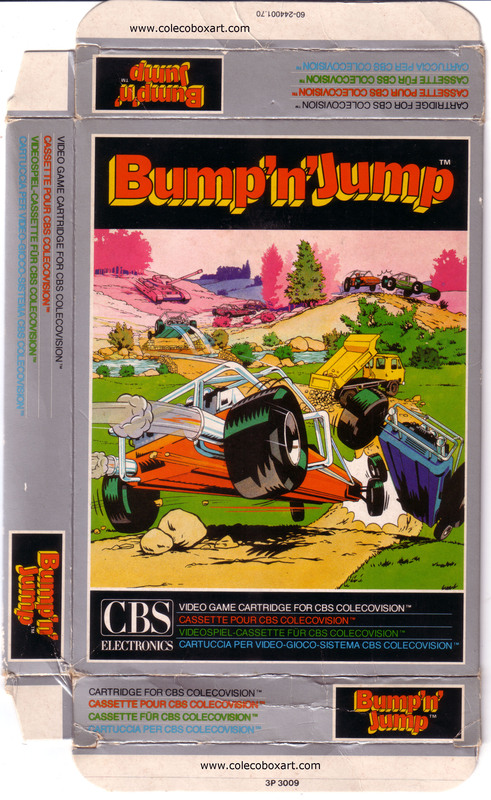 Bump’n’Jump has a challenge to fit your driving skill. 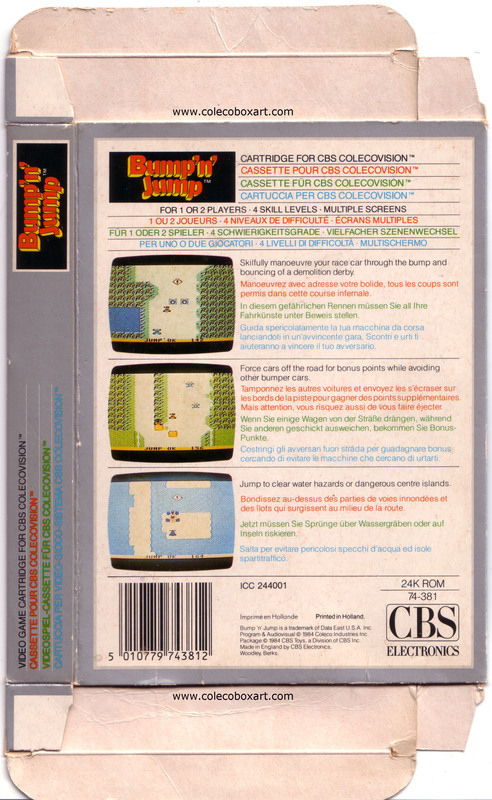 Port of Data East's arcade game released in December 1982. 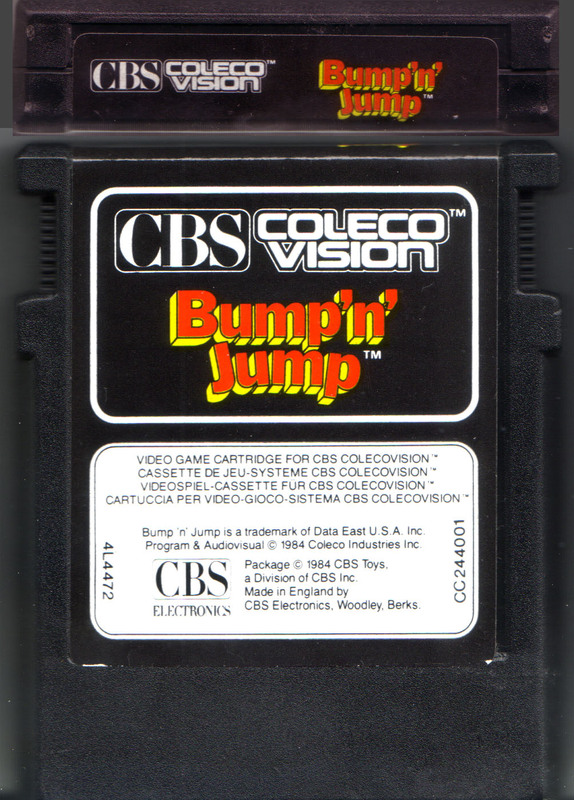 Bump 'n' Jump, known in Japan as Burnin' Rubber (Bānin Rabā), is a 1982 Japanese arcade game created by Data East Corporation for its DECO Cassette System. 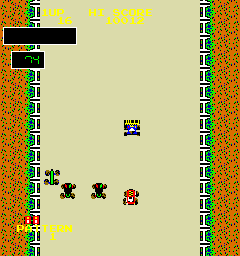 The game was also published by Bally Midway. Jason Mazure says in the FAQ : There is a bonus of 50,000 points when you complete a level without bumping off any emery cars. 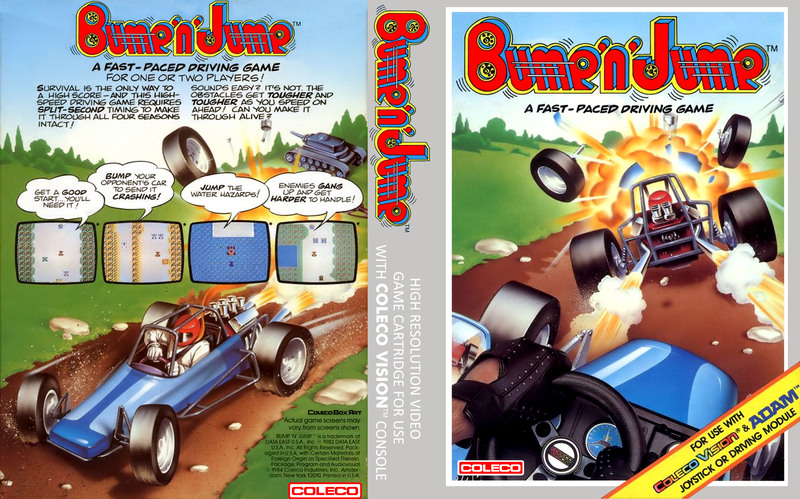 You can also cheat by speeding up at the very beginning of a level and jumping off to the side of the screen where you can't see your car. Landing there, you can cruise through the whole level without doing anything. If you play it to a million the letter G appears by the number of guys you have left. You can now have infinate lives for one or two levels.